Son of a classical pianist and a Maestro, Leo Gandelman began his career as a classical musician at the age of 15 performing as a soloist with the Brazilian Symphony Orchestra in the “Concertos da Juventude”. 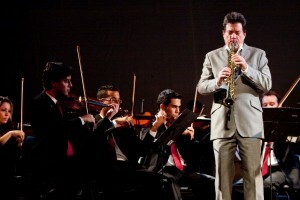 Even with a successful career in popular music, Leo never gave up on his classical training regularly performing in Brazil and abroad as a soloist with several orchestras, playing some of the brazil’s most important compositions written to sax and orchestra, such as “Fantasia for the Soprano Sax and Orchestra “by Villa-Lobos and o “Concertino for the Alto Sax and Orchestra”by Radames Gnattali. ORQUESTRA SINFÔNICA BRASILEIRA (ÓPERA & REPERTÓRIO) – CONCERTO VI – 2012 – Solista da OSB interpretando o Concertino para saxofone, de Radamés Gnattali. Regência de Roberto Duarte.